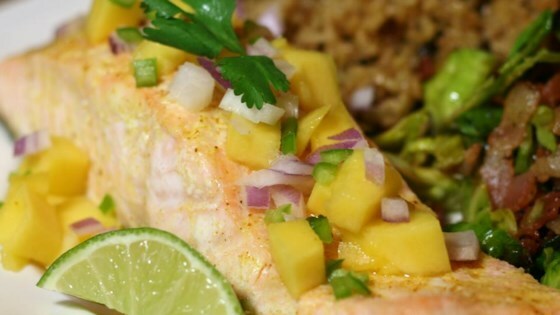 "Curried salmon with mango is best served immediately. Enjoy!" Place salmon on the baking sheet and fold edges of aluminum foil up over the salmon and crimp to seal. Bake in the preheated oven until cooked through and flesh flakes easily with a fork, about 15 minutes. Mix avocado oil, curry powder, and salt together in a small bowl. Pour over salmon. Scatter diced mango, red onion, and serrano pepper over salmon. Serve garnished with cilantro and a squeeze of lime. Healthy & delicious fish tacos for dinner! Substitute olive oil for the avocado oil if preferred.